The DSM-501 is a digital, tissue equivalent microR meter. (it can be easily switched to micro Sieverts). The DSM-501 has a flatter response than a sodium iodide unit, similar to a micro rem meter. 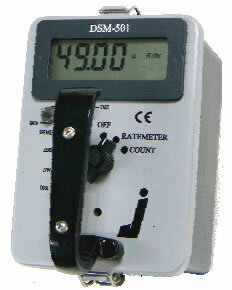 The auto-ranging survey meter features a large, four digit backlit, LCD. 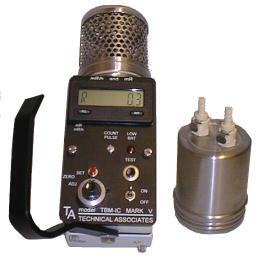 The meter includes an internal 1 inch x 1 inch plastic scintillation detector. The detector can measure gamma at the microR level as well as detect some betas. This newer design of plastic scintillation provides more accurate dose measurements than meters utilizing the traditional sodium iodide detectors. The DSM-501 is equipped with over-range alarms, regular alarms and diagnostics. An optional RS-232 data output is available on request. 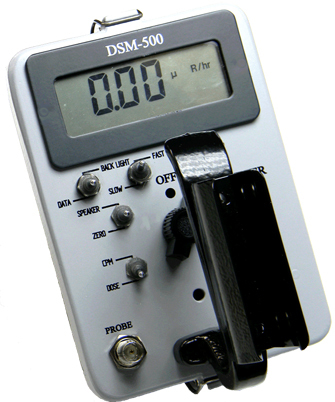 The DSM-501 Survey Meter is is recommended for nuclear power plant, health physics, and medical applications, or whenever dose measurement at the microR level is required. This microR survey meter is ideal for NORM measurement. Other applications include oil refineries and scrap metal facilities. Detector: Internal tissue equivalent plastic scintillator, 1"x1"